Soldiers from 709th Military Police Battalion and Hohenfels Army Health Clinic, were welcomed into the Corps of the Noncommissioned Officer during an NCO Induction Ceremony, at the Hohenfels Theater, Nov. 20. 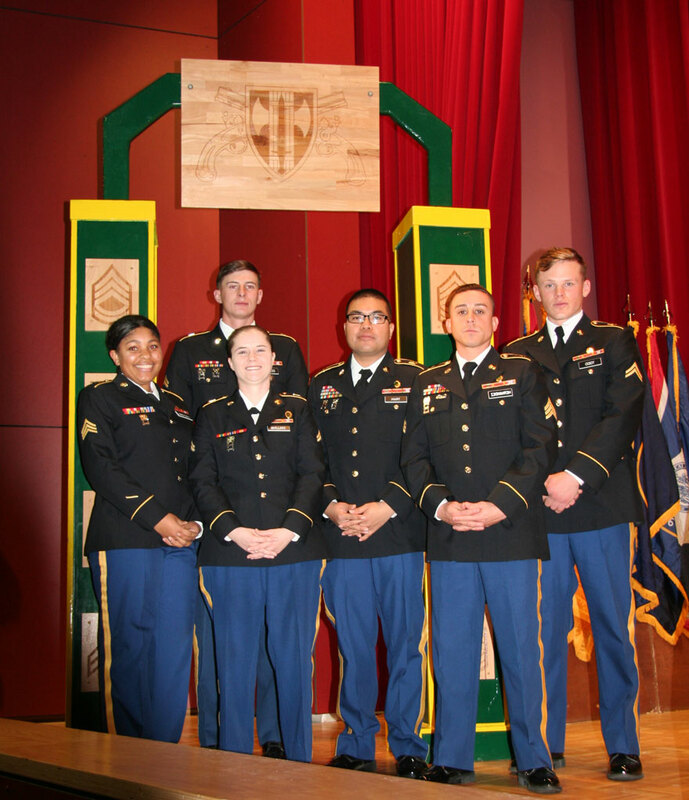 HOHENFELS, Germany – Soldiers from the 709th Military Police Battalion and the U.S. Army Health Clinic in Hohenfels, crossed the threshold from Soldiers to Noncommissioned Officers during an NCO Induction Ceremony Nov. 20 at the Hohenfels Theater. Twenty-eight Soldiers from the U.S. Army accepted their new duties and responsibilities with honor as each one walked through the NCO arch to officially become a member of the NCO Corps. Command Sgt. Maj. D. Marc. W. Stevenson, of U.S. Army 1st Battalion 4th Infantry Regiment OP4 and guest speaker at the NCO induction, highlighted the significance of becoming an NCO and moving from follower to leader. The entire ceremony, from the NCO Charge to the recitation of the NCO Creed, emphasized the importance of this critical step in the Soldiers’ careers. The choice of Noncommissioned Officers is an object of greatest importance. The order and discipline of a regiment depends so much upon their behavior that too much care cannot be taken in preferring none to that trust but those who by their merit and good conduct are entitled to it honesty, sobriety, and a remarkable attention to every point of duty, with a neatness in their dress, are indispensable requisites. A spirit to command respect and obedience from the men, to teach it, are also absolutely necessary. Nor can a Sergeant or Corporal be said to be qualified who does not write and read in a tolerable manner. HHD: Sgt. Shannon Jackson, Sgt. Marques Lemane, Sgt. Sean Outar-Douglas. 64 MP CO: Sgt. Camree Stuckey-Torres, Sgt. Anhkhuong Tran, Cpl. Joan Collins, Cpl. Tannen Todd, Cpl. Justin Collier, CPL Michael Carter. 527 MP CO: Sgt. Seth Boafo, Sgt. Emilio Estradamurillo, Sgt. Stephen Ford, Sgt. Lemuel Gayle, Sgt. Claudio Laspes, Sgt. Andrew Schaffert, Sgt. Korrick Tadlock, Cpl. Breionne Turner. 551 MP CO: Sgt. Ty Clark, Sgt. Michael Johnson. 615 MP CO: Sgt. Ezra Cavanaugh, Sgt. Nelson Felix, Sgt. Jasmine White, Sgt. Dylan Woodworth. USA Army Health Clinic Hohenfels: Sgt. Coday Conway, Sgt. Justin Farrell, Sgt. Fotty Manneh, Sgt. Natalie Riggs.